NOTE: After much research and consideration, and after consultation with the Executive Director of the B&O Railroad Museum, we are using the term “main line” as two words rather than the one word term “mainline.” While both terms appear in the literature, the preference in most cases, including in all of the dictionaries consulted, is to use two words, i.e. “main line.” Earlier, we had used the one-word term in the Proposal filed in this matter. Please also include references and full citations, and include supporting material in an electronic format (GIF, JPEG, PNG, PDF, DOC) which can be made available on the IEEE History Center’s Web site to historians, scholars, students, and interested members of the public. All supporting materials must be in English, or if not in English, accompanied by an English translation. If you are including images or photographs as part of the supporting material, it is necessary that you list the copyright owner. In the space below the line, please describe the historic significance of this work: its importance to the evolution of electrical and computer engineering and science and its importance to regional/national/international development. Many railroad electrification experiments and projects were proposed in North America, Europe, and elsewhere during the late 19th century. Each such proposal claimed to offer one or more improvements such as reduced expense, superior speed, power, acceleration, greater efficiency, and the elimination of the open flames, hot steam, and dense smoke associated with steam locomotives. Some of these early ideas came to fruition and resulted in important advancements in electric railway technology. On a portion of the Baltimore and Ohio Railroad (B&O) system, the company had constructed the Howard Street Tunnel that runs beneath a section of the central part of Baltimore, MD. City ordinance prevented the installation of smoke flues and vents to exhaust the heavy smoke produced by steam locomotives in the tunnel, especially when moving passenger and freight trains on the steep northbound upgrade. The need to reduce or eliminate the dense smoke and toxic fumes in the tunnel was the impetus for what became the world’s first main line railroad electrification. 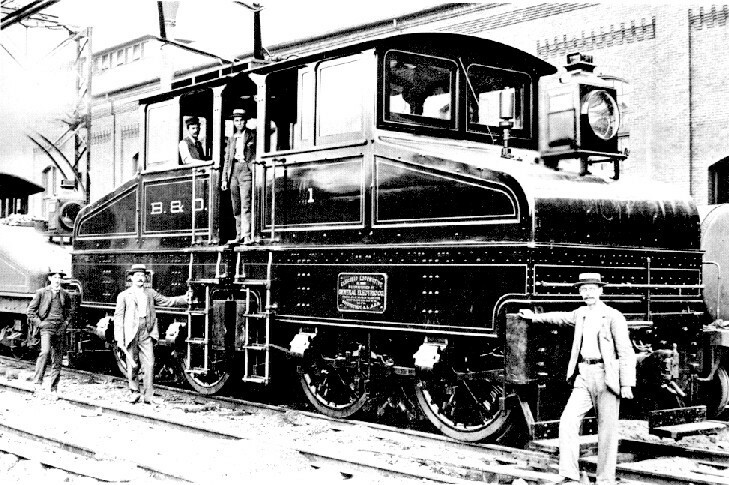 The B&O project required the design, engineering, and construction of electric locomotives, supplied by General Electric, that were 10 times more powerful than any electric locomotives built and operated up to that time. It was also necessary to design, engineer, and build large direct current (dc) power generating facilities and the entire distribution system required to provide power to the locomotives, tunnel lighting, and other electric power needs. 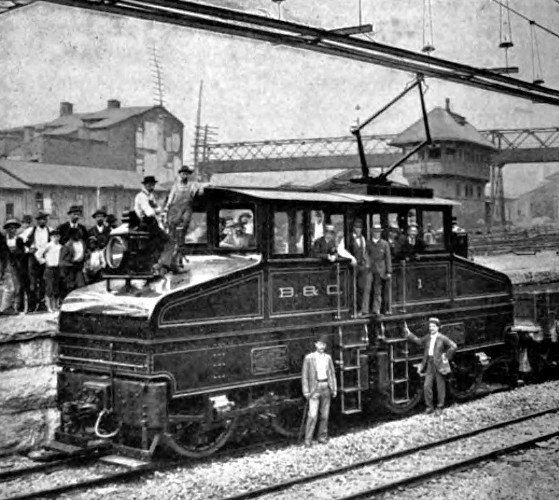 Overall, the B&O project required that electric street railway technology, then less than six years old, be advanced and scaled up to provide railroad operation equal in power to that offered by steam locomotives, which were, at that time, the product of more than sixty years of practical experience and continued design and engineering improvement. The first demonstration of the resulting B&O main line railroad electrification took place on 27 June 1895, and commercial operation began on 1 July of that year. The immediate success of the Howard Street Tunnel railroad electrification demonstrated to the world the practicality of electric propulsion of railroad locomotives. Within five years, major terminal electrification projects were planned in cities such as New York City and Paris, and the electrification of both local and long-distance railroads was being researched and planned in North America, Europe and elsewhere. Joseph J. Cunningham, “Howard Street Tunnel, origins of main line railroad electrification,” IEEE Power & Energy Magazine, vol. 8, no. 1, pp. 62 – 71, Jan./Feb. 2010. Hamilton Ellis, The Pictorial Encyclopedia of Railways, the Hamlyn Publishing Group Ltd, Middlesex, UK, 1968, pp. 430-432. What features or characteristics set this work apart from similar achievements? Born of the need to prevent heavy smoke and toxic fumes produced by steam-powered railroad locomotives in the new Howard Street Tunnel, the nominated Milestone achievement, implemented by the Baltimore and Ohio (B&O) Railroad in 1895, was the world’s first main line railroad electrification. It served as a prototype for later main line electrification projects throughout the railroad industry. The project called for the design, engineering, and construction of the powerful electric locomotives and all of the other associated facilities needed to produce and supply the direct-current (dc) electric power required. These features set the nominated work apart from other similar achievements. Earlier important electric railway developments related to street railways, elevated passenger lines, and other light-duty applications, as was outlined in the Proposal that was filed in this matter. The Howard Street Tunnel railroad electrification proved that suitable railroad electrification technology could be designed, engineered, and manufactured for standard and heavy-duty main line railroad use. 1. Alternating-current Electrification of the New York, New Haven & Hartford Railroad, 1907. (Dedicated May 1982, IEEE Connecticut Section). This important achievement post-dated the B&O achievement by 12 years. 2. Richmond Union Passenger Railway, 1888. (Dedicated February 1992, IEEE Richmond Section). This important achievement was a street railway. 3.Power System of Boston’s Rapid Transit, 1889. (Dedicated November 2004, IEEE Boston Section). This important achievement related to a rapid transit street railway. 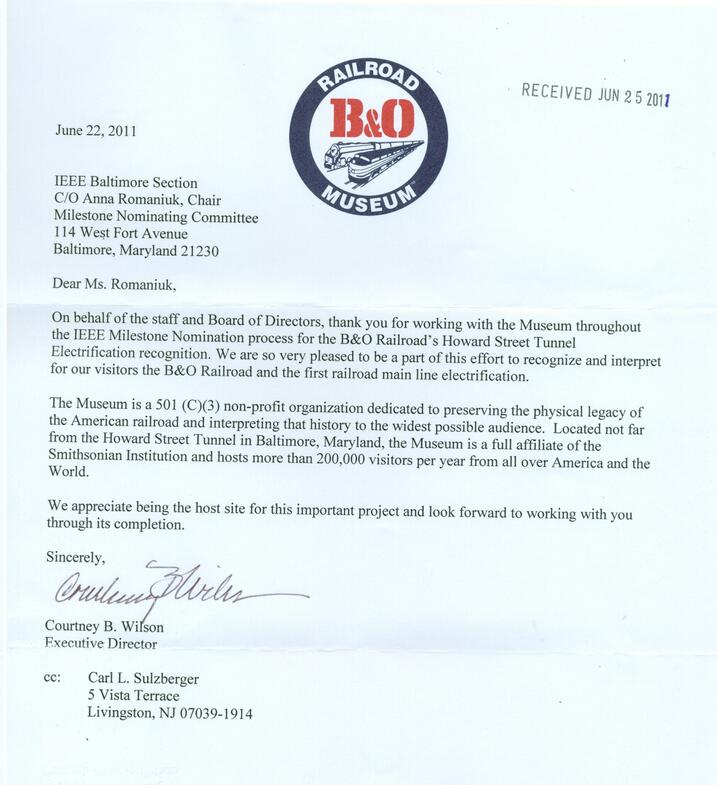 The attached 22 June 2011 letter from Courtney B. Wilson, Executive Director of the B&O Railroad Museum, demonstrates the Museum’s support for this Milestone nomination made by the IEEE Baltimore Section. The Museum will provide a location for the installation of the 12” X 18” bronze Milestone plaque. 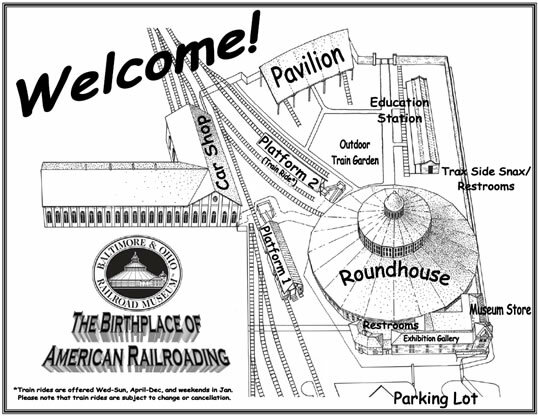 The proposed specific location for the plaque is at or on the exhibit covering the Howard Street Tunnel electrification, the very achievement honored by the nominated Milestone. The Howard Street Tunnel electrification exhibit is in the historic main Museum building. The matter of plaque location has been discussed with Executive Director Wilson, and he believes that the exhibit location will work. If, for some unforeseen reason, the exhibit location is not practical, a backup location is at the Education Station, a building where a number of other plaques have been installed over the years. This now backup location was mentioned in the Proposal filed in this matter in early February 2011. Attached is a diagram showing the layout of the Museum buildings on the 40-acre site at 901 West Pratt Street, Baltimore, MD. The remaining two of five total attachments to this Nomination are early pictures of the first electric locomotive designed, engineered, and constructed for the Howard Street Tunnel electrification. Both pictures are in the public domain, any copyright having expired many years ago. Please attach a letter in English, or with English translation, from the site owner giving permission to place IEEE milestone plaque on the property. This page was last edited on 30 June 2011, at 21:07.